The little pixie of Neverland. She's Peter Pan's loyal partner, but she has a short fuse, and she's very jealous of any girl who gets near Peter. With a little of her pixie dust, you can fly... if you believe. The little pixie from Neverland. Peter Pan asked her to accompany Sora and friends on their quest, but she's anxious to see Peter. She can restore party's HP, and prevents Sora from being defeated, though only once. Cost: 3 MP. A fairy with a jealous streak, especially when Peter pays attention to other girls. A pixie who lives in Never Land. Terra saved her from the clutches of Captain Hook. Ventus kept her company after she and Peter Pan had a fight, but then Captain Hook kidnapped her. She gets very jealous when other girls are around Peter Pan. The little pixie of Neverland, and Peter Pan's loyal partner. Tinker Bell is a little fairy who lives in Neverland alongside her best friend, Peter Pan, and has appeared in Kingdom Hearts, Kingdom Hearts Chain of Memories, Kingdom Hearts II, Kingdom Hearts 358/2 Days, and Kingdom Hearts Birth by Sleep. She is originally from Disney's Peter Pan. In Kingdom Hearts 358/2 Days, Tinker Bell was originally planned to have talk sprites. They were removed in the final game. When Ventus arrives at Never Land, he accompanies Tinker Bell to find Mickey's Star Shard. She is captured by Captain Hook, who then takes her to show Terra at Skull Rock. Terra tricks Hook into handing her Tinker Bell's cage, and frees her, allowing her to rejoin Ven and Peter Pan. After Hook's defeat, Ventus asks Tinker Bell to return the Star Shard. She reluctantly agrees at Peter Pan's request. Later on, when Aqua arrives and tries to join Peter Pan's hunt for treasure, she disapproves but reluctantly gives in after Peter Pan argues with her. Tinker Bell is introduced to Sora, Donald, and Goofy when they meet Peter Pan in the hold of Captain Hook's galleon. Tinker Bell informs Peter that she has located Wendy Tinker Bell shows a deep jealousy for Wendy due to her growing relationship with Peter, much to Donald's amusement. Tinker Bell sprinkles the trio with pixie dust, allowing them to fly. Peter rescues Wendy and flies off, leaving Tinker Bell and the others to fight for themselves. Tinker Bell is then captured by Hook and held hostage in a lantern - her life or the Keyblade is Hook's demand. Sora walks the plank, but escapes unscathed by flying. Peter then returns and saves Tinker Bell from Mr. Smee. After Captain Hook is defeated, Tinker Bell reappears and tells Peter of something happening at the clock tower in London. They go to the clock tower (Big Ben) in London where Sora seals the Keyhole on the clock face. Tinker Bell still fumes at Peter and Wendy's friendship and gets particularly angry when Donald laughs loudly at her. Peter asks Sora to take a delighted Tinker Bell with him as an ally. Sora gains Tinker Bell as a summon. After returning to Neverland, Tinker Bell tells Sora and Peter of the Phantom Heartless at the clock tower. Tinker Bell, from Sora's memories, appears in the Neverland floor in Castle Oblivion. Tinker Bell is first seen in the beginning when Sora, Donald, and Goofy enter Captain Hook's ship. She takes the three to see Peter Pan to help him find Wendy. After the fight against Captain Hook, Tinker Bell sees Sora and the others and gives them her summon card. Tinker Bell gives Axel and Roxas the ability of flight. Roxas first meets Tinker Bell on a mission to eliminate a Wavecrest Heartless in Neverland. Tinker Bell asks Roxas for help to stop Captain Hook and Smee's plan, gives him the ability to fly, then flies off toward Captain Hook's ship. In a later mission, Roxas and Axel go to Neverland to eliminate Artful Flyers. They soon meet Tinker Bell, who, though angry at Roxas for not following her the previous mission, gives Roxas and Axel the ability to fly, and flies off again. Roxas wishes to follow Tinker Bell, but Axel reminds him to focus on their own mission. A few days later, Roxas returns to Neverland to eliminate a Phantomtail. Shortly after his arrival, he sees Hook and Smee capture Tinker Bell and take her aboard the ship. Roxas sneaks into Hook's ship, and releases Tinker Bell from the lamp in which she is imprisoned. Tink shows Roxas a piece of a map that Hook had torn apart, marking the location of a treasure chest which Smee had uncovered. Roxas decides to investigate, and asks Tinker Bell to allow him to fly again. She agrees, and flies off. The next day, Roxas returns once more to eliminate an unknown heartless threat. Tinker Bell appears again, giving Roxas the ability to fly. After Roxas defeats the Ruler of the Sky, the Heartless crash-lands onto Hook's ship and badly damages it, much to Tinker Bell's enjoyment. Tinker Bell returns with Peter Pan as a summonable character, after Sora finds the Feather Charm in Port Royal, maintaining the same healing factor she did previously. 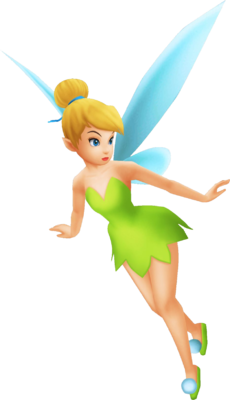 Tinker Bell is a very tiny female pixie that has blonde hair tied into a bun on the top of her head by a blue ribbon (dark blue in Kingdom Hearts). She has pale skin, black eyebrows, and blue eyes and wings. Tinker Bell wears a short, green, strapless dress and green slippers, each sporting a white puffball on the front. She also often has a gold glow or sparkle around her, the result of her pixie dust. Tinker Bell has a stubborn and childlike disposition. She is very attached to Peter Pan, and quickly becomes jealous whenever he is with another girl, particularly Wendy. She tends to act defensive when called out on her jealousy, as shown when Donald comments about Tinker Bell's jealousy of Wendy's affection for Peter in Kingdom Hearts. Tinker Bell is also short-tempered, expressing annoyance when Roxas fails to accompany her to explore Captain Hook's ship in Kingdom Hearts 358/2 Days. Despite this, she is caring and loyal to Peter Pan and his friends, particularly in granting Sora, Roxas, and Ventus the ability to fly. In Kingdom Hearts Birth by Sleep, when Tinker Bell is reluctant to hand over Mickey's Star Shard to Ventus, she complies when Peter tells her to relinquish the shard. In Kingdom Hearts and Kingdom Hearts Chain of Memories, she accompanies Peter Pan in rescuing Wendy, despite her evident jealousy of her. Tinker Bell takes enjoyment from the misfortunes of those she dislikes. This can be seen in her treatment of Donald in Kingdom Hearts and Kingdom Hearts Chain of Memories. In Kingdom Hearts 358/2 Days, Tinker Bell can be seen visibly giggling after the Ruler of the Sky crashes into Captain Hook's ship. In Kingdom Hearts, when summoned, Tinker Bell's appearance is different from the other summons. For one, party members remain on the battlefield and Tinker Bell doesn't vanish after a certain amount of time. Instead she remains with Sora, continuously healing him and his allies until dismissed (similar to Regen from the Final Fantasy series), and reviving him once upon death (provided that Sora does not get hit the second his HP hits 0, Tinker Bell will fully recover Sora's HP, similar to the Auto-Life from the Final Fantasy series and Kingdom Hearts 358/2 Days). Tinker Bell appears as a summon card after clearing Neverland's Room of Truth. When her card is used, Tinker Bell arrives and heals Sora over a set time period. Stocking multiple Tinker Bell cards create the Twinkle Lv2 and Twinkle Lv3 sleights, which increase the amount of health restored if the player consecutively taps when prompted. Tinker Bell is essential in the Confuse sleight. Additionally, Tinker Bell can be used as part of magic sleights that require the use of any summon card, including Gifted Miracle, Tornado, and Terror. In Kingdom Hearts II, however, since she comes along with Peter she only stays during the duration of the Summon Gauge. Her ability acts the same as it did in Kingdom Hearts. Tinker Bell originated from J. M. Barrie's 1904 play and 1911 novel Peter and Wendy. Barrie's play was the inspiration for the 1953 Disney movie Peter Pan. In the film, Tinker Bell is the pixie companion of the title character Peter Pan. She accompanies Peter on his journey to the Darling house where she (unwillingly) helps Peter teach the Darling children to fly to Neverland. Later, Captain Hook takes advantage of Tinker Bell's jealousy over the relationship between Peter Pan and Wendy Darling, tricking Tinker Bell into revealing Peter and his friends' hiding place. Tinker Bell later risks her life to save Peter Pan from Hook. Although she is injured, she recovers in time to return the Darling children home. This page was last edited on 1 April 2019, at 11:21.